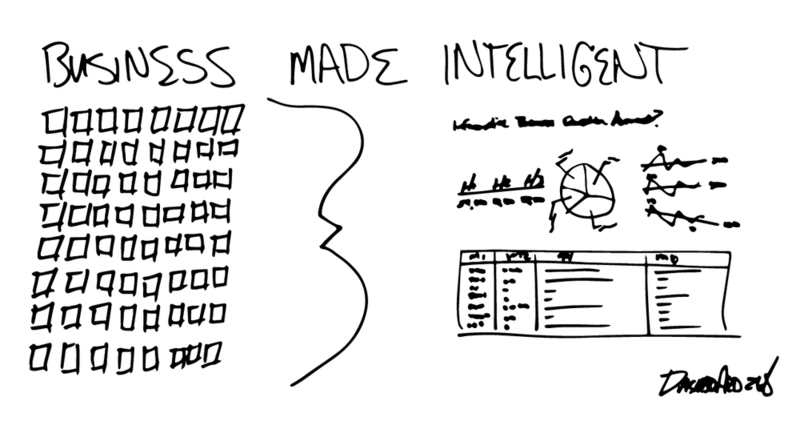 Business made intelligent, one design at a time, is at the heart of what I do. As a user experience designer and information architect, my speciality is business intelligence and workflow application design. I take people's stories and display them as a clear message, using principles of engineering, psychology, and artistic design. My years of designing applications, reports, and dashboards for an aircraft company helped their premier program get back on track. If you are looking to upgrade to a seamless, productive workflow or realize more valuable reporting for your organization, I'd be happy to hear from you. Executives want to understand the health of many parts of the company from a single location using key performance indicators. A conversation with a special projects focal for the executive team lead to observation, drawings, and the finished recommended design. The arrow mimics the company value stream, with a color palette for key performance indicator health, a vertical row of neon lights for each product line, and horizontally listed business questions. PowerPoint presentations are time consuming to assemble and difficult to understand: coherent thoughts across related slides are lost as the next slide replaces the last. A conversation with the analyst team lead to printing and understanding the best information design: wireframe drawings lead to the finished design and development with the IT team. The design included breaking down metrics into like areas of understanding, then re-creating them in a dashboard view, choosing layout, typography, and color scheme. Hundreds of PowerPoint + Excel presentation slides take three days worth of analyst time each week, frequently crashing, and encouraging human errors. Executives have difficulty parsing hundreds of slides for health information. A conversation with a small team lead lead to design of a supplier web application (not shown) and new automated business reports. BI and Web Development teams were engaged. The design included breaking down metrics into areas of value stream flow, choosing layout, typography, and color scheme. I designed LED bulbs to give an intelligent strip of light to illuminate key performance indicator information for each measure. Schedule performance over time is difficult to track in production, especially in areas where recovery plans are in place, and daily output is desired to be increased. Manually monitoring the information is time intensive and difficult. Conversations with the scheduling and production teams lead to drawings, evolution of the design, and a finished recommended design with layout, typography, and color scheme, then IT teams were engaged to build the solution. The design includes a left panel summary of key job health indicators, with one main right panel graphic displaying plan against performance. A speedometer provides plan vs. actual information; milestones illuminate daily goals.